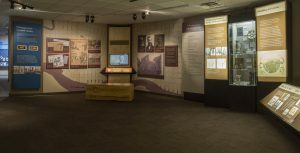 WILMINGTON, N.C. – Cape Fear Museum is pleased to announce that its Reconstruction gallery, which examines life after the Civil War, has been revamped to create a more accurate and inclusive account of life in the region. The time period after 1865, known to historians as Reconstruction, was marked by great changes. Most notably, it was a time when newly-freed African Americans gained social, political and economic rights. It was also marred by the rise of a white supremacy movement that caused one of the most significant events in Wilmington’s history – the race-based violence the city experienced in November of 1898. Museum Historian Jan Davidson said of the gallery redesign, “We believe our new interpretation will help visitors understand how the events of 1898 were a turning point in the state’s history as North Carolina began to pass wide-ranging segregation laws.” Additional historical information, artifacts and images have been added to enhance visitor’s understanding of the time period.